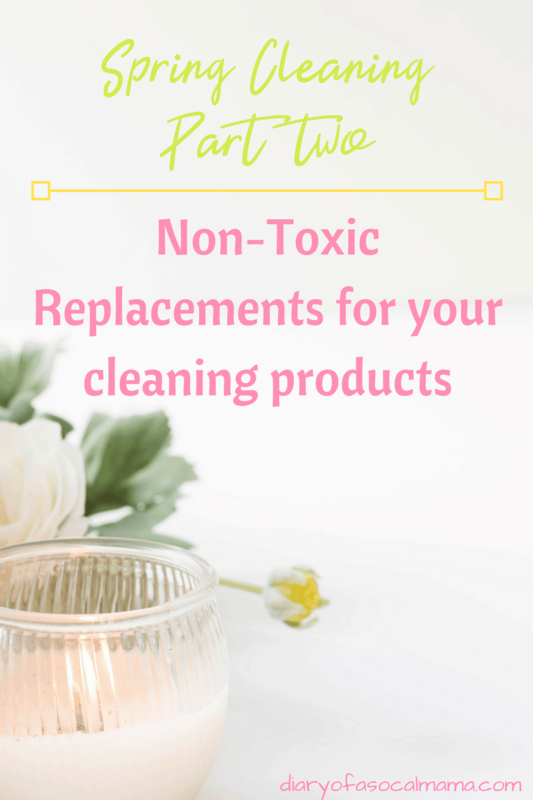 Welcome to part two of our spring cleaning series where we are helping you with non-toxic replacements for items around your home. If you missed part one where we discussed non-toxic replacements for your kid products be sure to check it out! Just as you need to consider what you put on your kids you also need to consider what you use around your kids. Throw out the idea that cleaning needs to be done with bleach and other harsh chemicals. 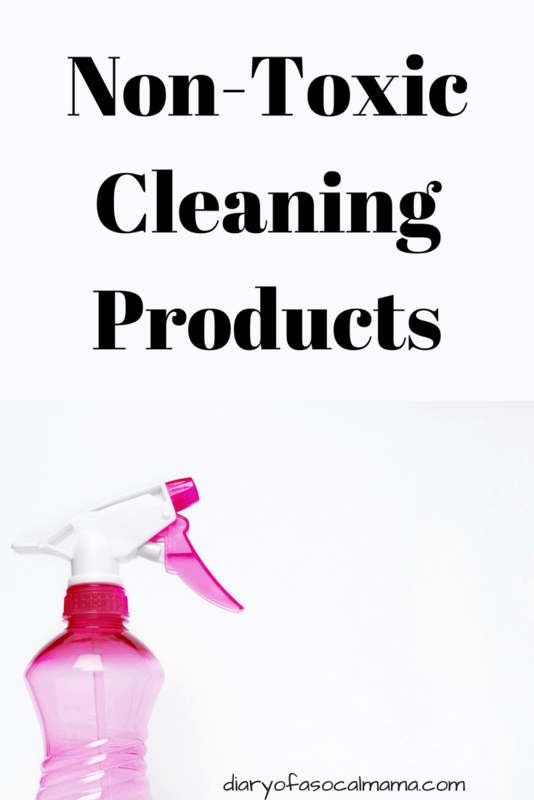 Replacing them with these non toxic cleaning products can make your home safer for you and your children, and it may even save you some money too! You can use the Environmental Working Group website to check your current cleaning products to see how they rate. This is an especially important switch to make if you have little ones crawling on the floor and putting everything in their mouths. Some studies have shown negative effects from residual product left on the surface that had been cleaned. Many items you use on your kitchen counters your baby’s high chair tray say on the label that they are not food safe! This post contains affiliate links. We will receive a small commission if you purchase through one of these links at no additional cost to you. Did you know you have an easy cleaner right in your house?! Vinegar is a great cleaning agent. Grab some empty spray bottles and fill with 1 part vinegar to 2 parts water. If you’d rather purchase a ready-made cleaner, one brand that gets good ratings on their product line is Earth Friendly Products. They can be found as a spray bottle or get the concentrated version and save some cash and plastic waste! We also love the Thieves concentrate from Young Living. Again this comes in a concentrate which we love and the smell is addicting. Chances are you have a friend who reps the company so go out and support her!!! We love the entire line of Thieves for the home. Washing: Clothes have more contact with your body than most other items in your home. Make sure you are keeping them free of dangerous chemicals. If you are already getting a box from Honest Co. go ahead and add on their laundry pods. So convenient and they get the job done! If you need more whitening, the commonly found Oxy Clean is a good option. If you’ve got a really heavily soiled load to do, get some of the tried and true Arm and Hammer Super Washing Soda. Don’t worry, this doesn’t mean you have to live with static cling. There is a simple fix to ditch your dryer sheets. Not only will you reduce your family’s chemical exposure but you’ll also be doing the environment a favor by switching to something reusable. Grab a set of wool dryer balls. These little babies can be used over and over again and won’t leave any chemical residue behind. You can also throw in a ball of aluminum foil or pin some safety pins to your dryer balls to help reduce static. Bonus: You’ll save money too! Rather than buying box after box of expensive dryer sheets you only need to buy these wool balls once and they will last for years to come. So much for green living being too expensive! The one place I’m most afraid to give up my bleach is the bathroom, specifically the toilet. You can make your very own fizzy toilet bowl bombs to replace that toilet bowl cleaner bottle. These use hydrogen peroxide and a little citric acid as the cleaning agent instead of dangerous chemicals. They’ll also look cute in a small container in your bathroom so you get some cute décor as a bonus. You can get the full instructions for making fizzy toilet bowl bombs from the MindfulMomma blog. Not into DIY? Use your all-purpose cleaning spray and an angled brush. Remember to take it slow when spring cleaning and detoxifying your products. Trying to replace everything at once may be overwhelming. So start with one and work your way up. As far as non toxic cleaning products go, I personally started with the dryer balls. This spring I plan to make some toilet bowl bombs and have started replacing my harsh surface cleaners as well. Stay tuned for part 3 of our spring cleaning and detoxifying series where we discuss how to spring clean your beauty routine.